Deir al-Zour is the end of the road in Syria for both, US and Russia, will they collide or reverse course? For the first time since the Syrian crisis began some seven years ago, there is a growing prospect of a military collision taking place between Russia and the United States over the oil and gas fields in and around Deir az-Zour. The US wants these wells to fall into the hands of the Syrian Democratic Forces (SDF) so they can be used to sustain a future Kurdish enclave or state in northern Syria. Russia wants them to revert to the sovereignty of the Syrian state so their revenues can help fund the country’s reconstruction. On Sunday, the Russian defence ministry held the US responsible for the deaths of senior military advisor Lt.-Gen. Valery Asopov and two colonels who were accompanying him who were killed when their position was shelled by Islamic State (IS) forces in the village of Marat east of the Euphrates River. Deputy Foreign Minister Sergei Ryabkov described the deaths as ‘the bloody price for two-faced American policy in Syria,’ adding that ‘the American side declares that it is interested in the elimination of IS … but some of its actions show it is doing the opposite and that some political and geopolitical goals are more important for Washington.’ The accusation was unprecedented, and led to a sharp rise in tension between the two sides. The village was the first site to be recaptured by Syrian government forces east of the Euphrates, and was being used as a base from which to control Deir az-Zour and retake the oil and gas fields to its east. The more damning accusation, in the view of many observers, is Russia’s claim to have evidence supported by photographs of collusion between US forces backing the SDF and IS east of the Euphrates. It also accuses the Americans of being behind the major assault launched last week by Hay’at Tahrir ash-Sham (formerly the Nusra Front) from Idlib governorate, which they control, against government positions in Hama, aimed at slowing the eastward advance of Syrian and Russian forces towards Deir az-Zour and the oilfields. On Tuesday, Russian Defence Ministry Spokesman Igor Konashenkov said Moscow was still awaiting replies from Washington to questions about ‘whom US Special Forces in Syria are fighting with and against’. He referred to images of former IS positions that had been taken by American Special Forces that showed no sign of fighting or aerial bombardment having taken place, and which lacked the protective defences that would normally be expected, implying collusion between the two sides. The US has had nothing to say about these charges, or about allegations by Iranian commanders that the US held back from fighting IS in Mosul and elsewhere in Iraq and Syria. One of the triggers of the Syrian crisis was that the government in Damascus turned down proposals to build a pipeline through Syria to carry Qatari gas to Europe. It did so partly at the request of Russia, which feared that the project was aimed at under-cutting its own gas exports to Europe. Now another ‘oil war’ seems to be looming in the east of the country. This poses a serious question: Is the ‘war on terror’ declared by the US a mere façade, or are Russia’s accusations of US collusion with IS and al-Qaeda off the mark? And when did this alleged collusion begin, at the outset of the crisis or just in the past year? We cannot offer answers at present. The American side has not presented evidence to disprove the Russian claims. But no evidence is needed of the US’s strong backing for the Kurdish SDF as it fights to secure control of al-Raqqa and the Deir az-Zour oilfields, and takes steps toward establishing a Kurdish state in northern Syria by holding municipal elections to be followed by parliamentary polls. Russia can be expected to exact revenge for the killing of its commander and two colonels, as it did by launching airstrikes targeting Nusra Front commanders in Idlib in retaliation for an earlier attack on its troops. This could result in US forces on Syrian soil coming under Russian attack, potentially sparking the fuse of a confrontation. The next big crisis brewing in the region may not stem from this week’s independence referendum in Iraqi Kurdistan, but from growing tensions between the US and Russia – though Washington’s ambiguous attitude to that referendum, and to Syrian Kurdish separatist plans, is inextricably related to that tension. Together, Saudi Arabian and Qatari rulers bankrolled armed rebellions that destroyed Libya, Syria, and Yemen. They offered political and military support to all armed groups that are willing to fight regimes they do not like. Their united front against their common enemies did nothing to remove their own internal problems. Now, they have to face those problems and from the first look, they shattered. 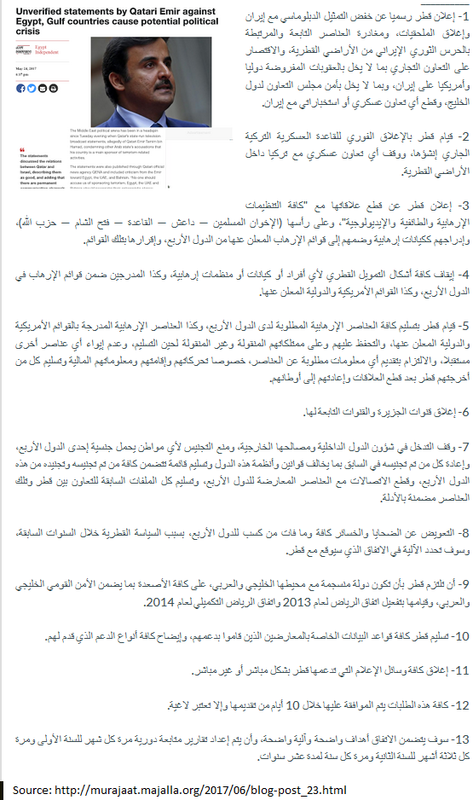 Previously, the club of rich nations known as the GCC worked together to force poor Arab countries fall in line. They exerted their power to expel a founding member of the Arab League, Syria, out of the intergovernmental organization. When Qatar hosted the annual summit of the Arab League, it maneuvered to give Syria’s seat to some obscure figure from the Syrian opposition groups. On May 22, while in Saudi Arabia, Trump met with about 53 representatives of government of Arab and Muslim nations to show a united front against what he called “radical Islamist terrorism.” A day after he left, media outlets from Saudi Arabia and UAE accused Qatar of undermining Arab unity by supporting terrorism and cozying up to Iran. On the charge of supporting terrorism, Qatar essentially replied by invoking the proverb: the pot calling the kettle black. Indeed that sums it up: Saudi Arabia is the only regime that espouses the radical interpretation of Islam called, Wahhabi Salafism. They worked on promoting this creed around the world under the guise of Sunni Islam. Every fighter joining al-Qaeda or ISIL is a follower of this radical creed. 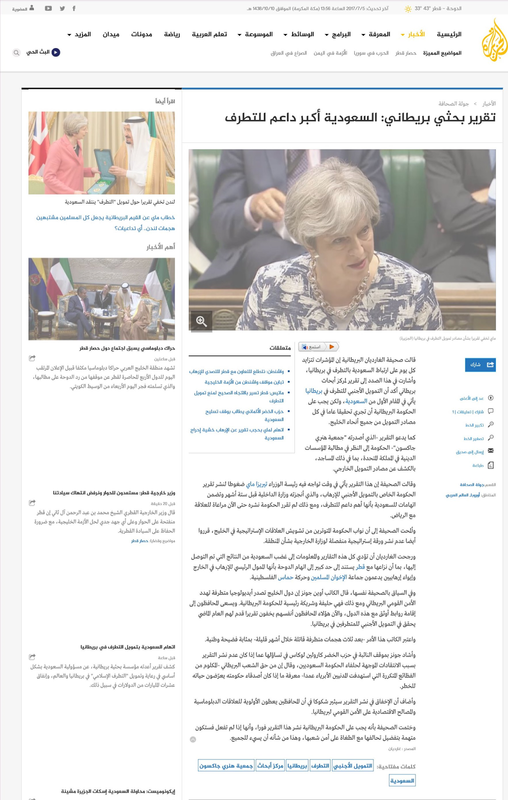 So it is laughable that Saudi Arabia is accusing other governments of supporting terrorism while its rulers have provided weapons to Salafists fighting in Syria and Libya and used its resources and connections to spread Wahhabism through Islamic centers all over the world. Rulers of Qatar seem determined to resist its bullying neighbors this time. They activated their assets, mainly well-financed and well-staffed media powerhouse, Aljazeera, and members of and sympathizers with the Muslim Brotherhood. Qatar might be behind the leaked emails of a diplomat from UAE. 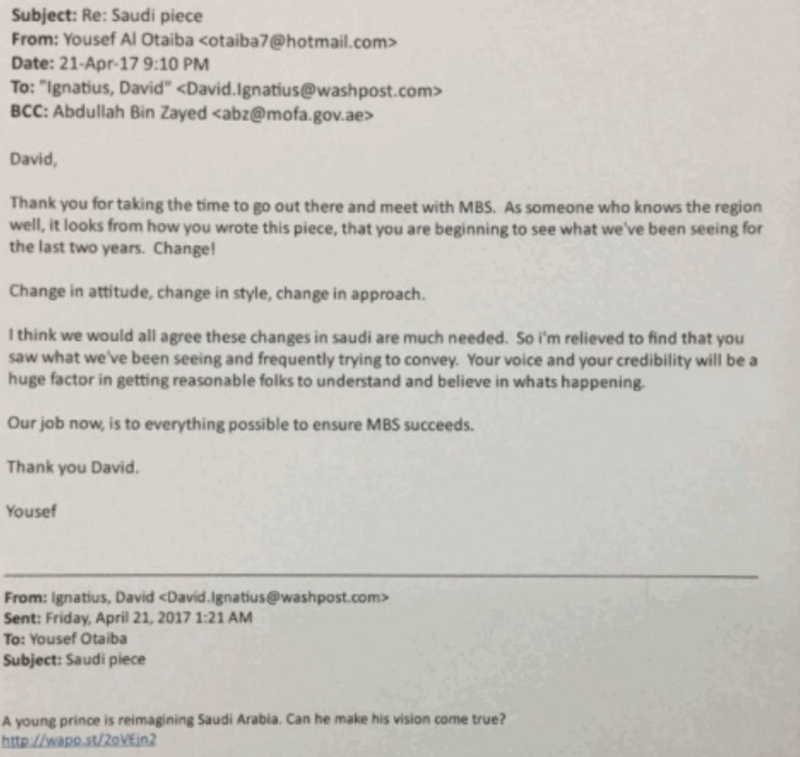 The emails show that the GCC states used their wealth to hire the best and most influential PR and lobbyists to influence policy makers and governments around the world and in the United States. One of the emails show how Gulf States’ diplomats promote one prince over others and how they work with journalists to raise the profile of individuals they like and raise concerns about groups and governments they do not like. The coming days and weeks will reveal more since these two countries worked together to destabilize other countries. Each side will be leaking more emails and diplomatic documents that will show the extent of their involvement in creating shady alliances, destabilizing other countries, and using their assets to mask all their covert operations around the world.